Knowledge of chords is at the heart of good improvisation so time spent exploring the chords used in this style will pay dividends in your lead playing. 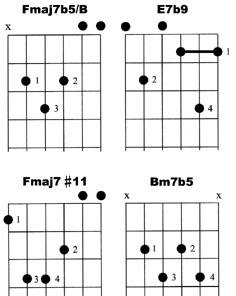 Most of the chords used in this style are your run of the mill shapes - the ones pictured below are just some of the lesser known chords. What key are we in ? You could put the root on an E major and get a moody very spanish sound but it is more usual to put the root on A minor so the key we're in for the purpose of looking at the chords is A minor (spanish). The "three chord trick" ( I IV V ) for this key is A minor, D minor, E major so a good starting point is to learn as many different shapes and arpeggios of these three as you can as these are the building block chords. To help get you started on this I have tabbed out all the ways I might play A minor. Please understand that all these chords are inside the key structure and that in practice some chords that are outside the key could be added to a piece in the same way that accidental notes can sometimes be added to the scales. Learning the key structure is important for putting the scales into context. In the following lessons I'll put some of these chords to use and talk about sequences.